A Journey by Bus Essay. Welcome to our website. This is the one of the best and an unlimited source of Essay and Paragraph. 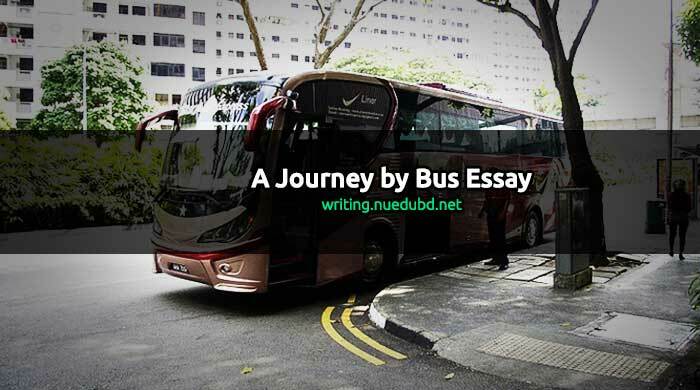 Now NU EDU BD writing section sharing the most useful A Journey by Bus Essay for you. I hope you'll like it. Education is the one of our basic right. Now check this out. Introduction: The journey made by bus is called a journey by bus. It is highly enjoyable. With the advancement of science and technology, the bus journey has become easy and comfortable. Last month, I made a journey by bus. I enjoyed it much. The memories are still fresh in my mind. Occasion: During the summer vacation, I got a golden opportunity to visit my uncle who lives in Dhaka. My father permitted me to go to my uncle’s house. I along with my elder brother went there by bus from Satkhira bus terminal. Arrangement: We made proper arrangements before three days of taking the journey. We washed our clothes and bought tickets before a day. On the fixed date, we reached the terminal half an hour before starting the bus. Start of the journey: The bus ‘Eagle Paribahan’ started at 8.30 a.m. from Satkhira bus terminal to Dhaka Gabtoli. The bus driver started the bus and everybody felt calm. Inside the compartment: It was a large bus. Almost all the seats were packed. Inside the compartment, there was no open space because there were lots of bags and luggage. After the start of the bus, the supervisor checked the tickets whereas the passengers were talking, some were reading newspapers, some were sleeping. Description: I greatly enjoyed the bus journey. When the bus started, I got thrilled. I opened half portion of the window pane. I looked outside. Our bus was going through open spaces. The road divided the area into two halves. I looked at the beautiful atmosphere. The green fields and ponds, canals seemed to me as the blessings of nature. Sometimes the bus was running speedily and in some places, it became slow to give place to other vehicles. The entire natural atmosphere including trees, fields, bushes, forests seemed to be running in the opposite direction of the bus. I was observing newer and newer sights going out of my sight as the bus moved forward. River crossing by ferry: After four hours of starting, our bus reached Daulatdia ferry ghat. I got down from the bus. I enjoyed the dazzling sight of the river. Our bus went to board the ferry. At the ferry, the hawkers were selling chanacur and other foods. I bought chanacur and ate standing on the deck of the ferry. At that time gentle breeze was blowing along with soft heat. The total atmosphere seemed dreamy to me. After one hour, ferry reached the Paturia ferry ghat and our bus started its journey again. A narrow escape from an accident: Our bus started fast. The road was clear. Sometimes some cars and trucks were coming from the opposite side. I was somewhat calm them. I felt relaxed. I was ruminating about different things. I felt a cat sleep. All on a sudden, I was alarmed at a jerk. I got fear. When I looked outside, I was terrified to see that our bus was about to fall on a roadside hole. Thank God, our driver succeeded to keep the bus safe. All the passengers were grateful to God for saving us from a serious mishap. Destination: After this, our bus was running slowly. Everyone was in unknown perturbation. The bus stopped at various places and I was passing time in agitation. At 2. p.m. our bus reached Gabtoli bus terminal. I got down form the bus. One of my cousins was waiting for us at the terminal. He greeted us. We got on a rickshaw with him and reached our destination. Conclusion: Our bus journey was a thrilling one though we had a hair-breadth escape. I enjoyed it much. It will not be forgotten from my memory. It will remain ever fresh in my mind for ever.